The logistical demands of today's business world are a challenge to meet, and sometimes even hard to define. That's where our mission begins. With more than 20 years of experience providing custom delivery solutions, we don't just make deliveries, we build systems. We turn challenges into long-term, cost-effective business practices. Log in to access your account or to schedule a delivery. Request a Delivery -- To request an expedited delivery, call (843) 215-4005 or use the contact form to get the process started. Check our service area map to be sure we can suit your delivery needs. 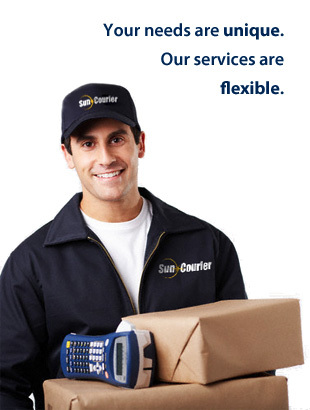 Let's Talk -- To get an assessment of how Sun Courier can help your organization, fill out the contact form.